For the devotees of mother Durga the most authentic text is the Durga Saptashati. This ancient text is actually a portion of the Markandeya Puran. This Puran contains, among other things, details about the rites and rituals for devotion to goddess Durga. Of the 134 chapters in the Markandeya Puran, 13 chapters, (chapters 78 – 90) are devoted exclusively to goddess Durga. Our sages have opined that those who wish to pray to goddess Durga as their main deity, should follow the directions given in these chapters. These thirteen chapters, along with other material that our sages have added over time, are collectively known as the Durga Saptashati. To be able to recite the whole text would not be possible given the constraint of time in this day and age. Therefore, the sages have further concluded that if one was to recite the three major prayers of the Durga Saptashati – durga kavach, argala stotra and the keelak stotra, one would get the same benefit as if he/she were reciting the complete Durga Saptashati. 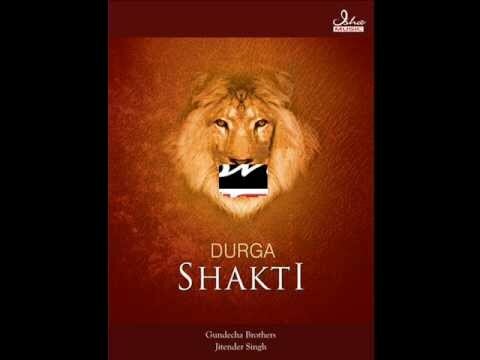 Accordingly, this album contains these three prayers in conjunction with an invocation prayer (mangalacharan), and a prayer in praise of goddess Durga (durga stuti). The album also contains the bhagavati stotra, a prayer for forgiveness (kshamaa mantra). and finally the famous Durga aarti, om jai ambe gauri. While Goddess Durga is worshipped throughout the year, there are two specific nine-day-periods called the navraatri, which are considered especially auspicious. These fall during the month of March-April and then in September- October. The dates vary according to the lunar calendar and can be confirmed from the Hindu almanac. It is widely believed if a person listens to, or recites these prayers during these periods he/she can get whatever boon he/she wishes for.